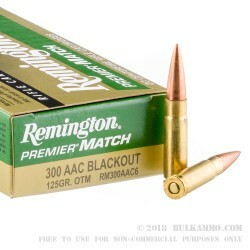 These .300 BLK rounds from Remington's Premier Match lineup are made with express intent to set competitive records and leave one ragged hole on long range targets. As such, each cartridge is topped with a "Sierra MatchKing" open-tip match (OTM) projectile which possesses a precise meplat, elongated boat tail, and secant ogive for ultimate in-flight stability and drag resistance. While the OTM design is not recommended for hunting applications, it has become a favorite among modern military snipers for its superb accuracy and unmatched terminal performance on enemy combatants. The round has a notched cannelure at its major diameter which preserves its accuracy potential throughout heavy recoil and repeat chambering. 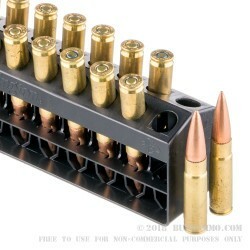 As a bonus, the .300 AAC Blackout projectile features a covered base and leaves minimal fouling in the barrel of your favorite rifle for improved longevity and consistent muzzle velocity. 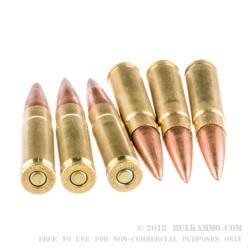 Each 125 grain bullet is contained within a reloadable brass casing which contains a weight-checked powder charge that is ignited by a non-corrosive Boxer primer at its seat. Remington is one of the oldest names in the American shooting industry and the only company that still manufactures both firearms and ammunition. Two centuries of experience alongside a passion for proven results allows them to manufacture pristine products that answer the demands of multiple disciplines with exacting specification.